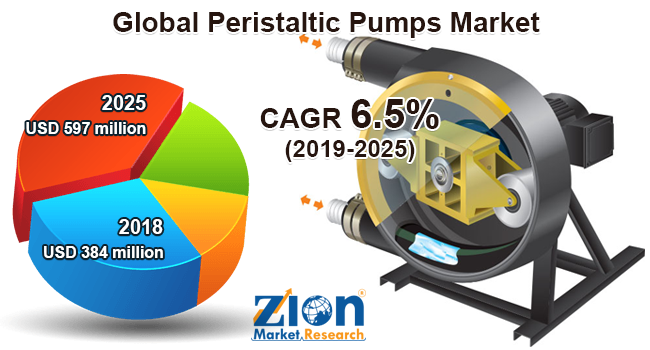 Zion Market Research has published a new report titled “Peristaltic Pumps Market by Type (Hose Pumps and Tube Pumps) and End-User (Water & Wastewater Treatment, Pharmaceuticals, Food & Beverages, Mining, Pulp & Paper, Chemical Processing, and Others): Global Industry Perspective, Comprehensive Analysis, and Forecast, 2018–2025”. According to the report, the global peristaltic pumps market was valued at USD 384 million in 2018 and is expected to reach USD 597 million by 2025, at a CAGR of 6.5% between 2019 and 2025. A peristaltic pump is used for transportation or movement of liquids and fluids. Usually, there are two types of peristaltic pumps—tube pumps and hose pumps. These tubes and hoses are made up of different materials, such as fluoropolymers, vinyl, silicone, ethylene propylene diene monomer rubber, nitrile buna rubber, and natural rubber. These pumps are widely used across various industries, such as pharmaceuticals, food and beverages, water and wastewater treatment, mining, and chemical processing. The global peristaltic pumps market is anticipated to grow significantly in the next few years, owing to the increasing awareness regarding saving maintenance costs and operational efficiency. The rising demand for peristaltic pumps in the pharmaceutical industry across the globe is expected to drive this market’s growth across the globe. Peristaltic pumps are widely used in processing botanical drugs and herbs, manufacturing biological and medicinal, pharmaceutical products, and isolating active medicinal principles. Moreover, the growing use of water and wastewater treatment is also another driving factor of the peristaltic pumps market. However, frequent replacement of tubes and hoses is likely to slow down this market’s growth in the upcoming years. Alternatively, product innovation to enhance the capacity of these pumps is further projected to offer new growth opportunities for the peristaltic pumps market in the years ahead. The global peristaltic pumps market is classified based on type and end-user. Based on the type, the global peristaltic pumps market includes tube pumps and hose pumps. Tube pumps are expected to lead the global peristaltic pumps market in the future, as they are widely used to pump fluids containing suspensions of abrasive solids and corrosive liquids. Peristaltic tube pumps have dry and non-reinforced casings and usually use rollers to provide the forward displacement of liquid. Silicone rubber, fluoropolymer, and PVC are few major raw materials used to manufacture these pumps that make it highly suitable for food and beverage and pharmaceutical industries. By end-user, the market includes water and wastewater treatment, pharmaceuticals, food and beverages, mining, pulp and paper, chemical processing, and others. Food and beverages and pharmaceuticals segments are projected to grow at the fastest rate in the upcoming years, owing to the rapid growth in these industries globally. By region, Asia Pacific contributed the largest share toward the global peristaltic pumps market in 2018 and is expected to continue its market dominance in the future as well. The surging demand for peristaltic pumps in various end-user industries like pharmaceutical, water, and wastewater treatment, and chemical processing is estimated to drive this regional market growth. Europe and North America are anticipated to grow significantly over the forecast time period, owing to the flourishing pharmaceutical and food and beverages industries in these regions. Some key players of the global peristaltic pumps market include Cole-Parmer Instrument Company Limited, Gilson Inc., ProMinent GmbH, Verder Holding B.V, PCM Group UK Ltd., Watson Marlow Limited, Wanner Engineering, Inc., Flowrox, Inc., Randolph Austin, Graco, Inc., Seko Spa, and Albin Pump AB.